Bedside fall mats are positioned besides bed to cushion accidental falls. They are used in common residences, nursing homes, senior care facilities, and hospitals to prevent elderly and disabled individuals from serious injury if they fall from their beds (Wikipedia). Fall safety mats are considered a core component of an integrative fall prevention strategy (Mayo Clinic). 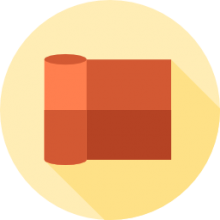 length to provide fall coverage for average-sized beds. One of our favorites is the Drive Medical Fall Safety Mat. It is a three-paneled fall mat (see it folded below, and unfolded above). It's a quick and easy way to provide fall safety protection for an elderly loved one and the Drive Medical brand is renown for quality eldercare & medical products. Length: 72"; Width: 30"; Height: 2"
Let's take a look at 5 of the best-selling safety fall mats for the elderly and see how they compare. This blue tri-fold bedside mat offered by Drive Medical is comfortable, soft and practical for anyone worried about falling off the bed. Users love the price and the size, but some do note that there is no handle for transportation. This blue bed fall mat measures 72” x 30” x 2”, and it has a weight of three pounds, three sections, and a durable vinyl cover. It’s made of high-density foam that will absorb any impact and prevent you from injuring yourself if you fall. The fall mat also has a non-skid bottom so that it won’t slide on your floors. In general, users have a favorable opinion of the Drive Medical tri-fold bedside rug. A buyer shares that this bedside carpet helps his grandmother feel safe at night and that he doesn’t worry that she is going to hurt herself. Another user mentions that fall mat arrived promptly and that it works better than he anticipated. The reviewer adds that the floor mat is comfortable and that he would recommend it gladly to anyone looking for an efficient fall mat. Another happy purchaser comments that the tri-fold bedside carpet is worth its price and that it’s well-made. However, some customers have complained that the stuffing is not enough and that the mat flattens out quickly. Some users also note that the bedside fall mat slides on wooden floors. This bed foam fall mat offered by Fid-Med is well-designed, soft and useful for protecting yourself from injuries. Users love the comfortable, thick surface, but some do note that it’s slightly expensive. This fall prevention mat measures 24 x 66 inches and it’s made of two-inch high-density polyurethane foam. It has a durable vinyl cover that is easy to clean and one year warranty. You can choose from two models – one piece or bi-fold. The bi-fold has two sections that are held together with fasteners. This fall bed mat is also flame retardant and meets the requirements of California Technical Bulletin. Overall, the Fid-Med fall mat is an excellent choice if you want to feel safe while you’re sleeping. If you are looking for a top-notch protection during your bedtime, you might look at this bedside safety pad offered by Secure. Users love the quality of the material, but some do note that there is a rubber smell present. This fall protection pad measures 30″ x 66″ x 2″, and it’s made of high-impact absorption foam. It has a trifold design for easy storage, a one year warranty, a weight of 7 pounds, and a slip-resistant cover, which is also flame retardant and latex-free. This fall prevention mat reduces the risk of serious injuries to 0% if you fall from an 18-inch height. In general, users are extremely satisfied with the design and performance of the Secure fall mat. A buyer comments that this bedside carpet is made of thick material and that you can fold it quickly. The reviewer adds that he liked the protection carpet so much that he bought another one. He highly recommends the Secure floor mat. Another happy customer mentions that the carpet provides a soft landing and that the quality far surpasses the price. The purchaser also shares that he feels less worried about his mother’s safety since he has the mat. However, some customers have complained that the safety mat is hard to walk on and that it has to be folded when it’s not in use. This bedside protection mat offered by Posturchek is well-designed, well-made and convenient. Users love the soft surface, but some do note that it’s expensive. This fall mat for bedrooms measures 24” x 70” x 1”, and it has a weight of 9.4 pounds, and a non-slip textured top to prevent you from slipping on it. The fall pad also has a non-skid bottom to keep the mat in place. It’s made of impact absorbing molded foam, and it has beveled edges that allow easy access for wheelchairs. Overall, users have a high opinion of the NYOrtho prevention mat, and they don’t have any major complaints regarding its functionality. A satisfied buyer comments that he uses this fall safety mat in his care facility and that he is very impressed with the quality. He highly recommends it to anyone looking for a bedroom fall mat. Another reviewer also states that the mat doesn’t slide and that it’s easy to walk on it. The reviewer also adds that the mat folds in seconds and that his mother feels safe to sleep at night. However, some customers point out that this protective bed is only 1-inch thick and that it might not offer the same level of protection as thicker mats. 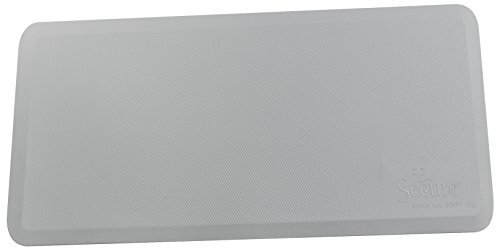 If you want a top-rated safety mat for your bedroom, you might take a look at this large flat pad offered by Secure. Users love the size and the thick surface, but some do note that it’s not easy to walk on it. This bedside protective mat measures 70 x 36 x 0.8 inches and it has sealed beveled edges, a waterproofed cover, and a one year warranty. It’s made of elastomeric foam for maximum injury protection. The fall pad also has a non-skid top and bottom to protect you from slipping and a low one-inch profile so that you can step on and off the mat, with ease. Overall, users have a very high opinion of the Secure fall prevention mat, and they don’t have any major complaints about its performance. A buyer comments that this bedside rug allows his sister to feel confident and independent and that the mat doesn’t slide when you step on it. Another customer shares that the floor rug provides adequate cushioning and that it’s easy to clean it. The reviewer recommends it to anyone looking for the best fall mat available. A happy purchaser adds that the large bedside mat works far better than he expected and that you don’t feel anything if you fall on it. However, some customers have complained that this bedside fall carpet tends to move and it needs to be repositioned. A user also states that the rug is so thick that it might trip someone. 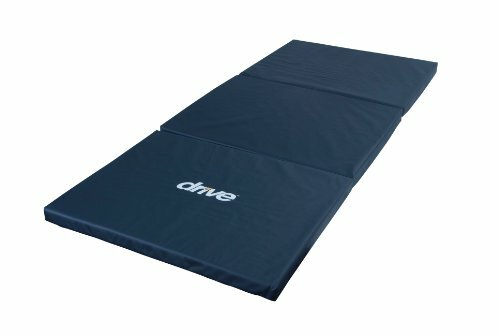 One of the first fall prevention mats for the elderly that we took a look at was the Drive Medical three-panel bedside mat. Drive Medical says that their bedside fall mat is engineered to decrease injuries that occur from bed falls. It can fold up because of its three-paneled design to be conveniently stored and transported. It features a high-density foam construction so that it is able to absorb the weight of a patient or loved one falling onto it from the bed and its non-skidding bottom surface ensures that it has a high degree of traction so that it remains in place beside the bed. Overall, Drive Medical has designed this bedside padded fall prevention mattress to provide and an easy and effective way for individuals prone to falling from bed to have a medically safe landing spot. One buyer that we interviewed had purchased it for their elderly relative that was suffering from Alzheimer's. As this senior citizen had aged she had become, paradoxically, much more active and difficult to manage. And she had experienced a really nasty fall getting out of bed one evening unassisted- so her caregiver decided to purchase a fall mat to protect her from injuring herself late at night when she was prone to going to the bathroom without assistance. Many buyers describe preferring to purchase their fall prevention mats online as opposed to local medical supply stores where the price is often higher. Another buyer told us that while the quality of the foam is good, they found that the bottom surface did not grip to the wooden floor as strongly as they would've liked. The second option we examined was the Fid-Med foam fall prevention pad. Its manufacturers say that it is designed to deal with impact-related injuries whenever an incapacitated individual takes a fall from a bed. Some buyers describe outfitting their homes with security standing poles, shower stools, and toilet safety rails to make their elderly loved ones more comfortable and keep them as independent as possible. It is constructed from 2 inches of polyurethane foam that is high density and high compression. The manufacturers have also included a vinyl cover which makes it easy to clean. Because of its folded sections, you can easily hook them together with the hook and look fasteners, making it easy to transport for residential and hospital care facilities. The third option we examined was the Secure fall safety mat. The manufacturers say that their padded bedside fall mattress is engineered to be a component in an integrative fall prevention strategy for a home or senior care facility. It has a three-panel design so you can fold it up pretty compactly and it also includes a one year warranty. Buyers we spoke to were pleased with the solid density of the bedside fall mattress material saying that it also folds up really easily. Since it is so easy to fold up, many buyers put it away during the day, and then take it out at night and array it alongside the bed of their loved ones or patients. 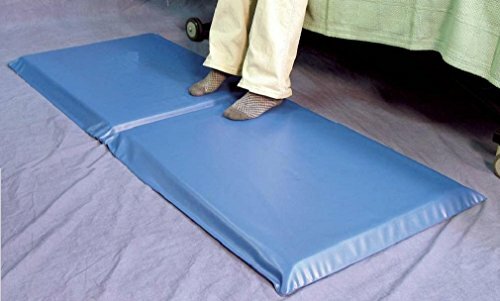 Indeed, another reviewer told us since it is not comfortable to walk on, the most convenient option for them is to store it away during the day and unfold it at night so that they're all Alzheimer's afflicted mother is protected against dangerous bedside spills. Another option we examined was the Posturchek Fallshield bedside fall prevention mat. It has 1-inch foam padding designed to absorb the impact with its molded rubber and foam construction. One interesting feature of this bedside fall mat is that its beveled edge enables wheelchairs, rollators, lifts, and other rolling devices to easily climb up its surface.